3 years ago in wlsdm weblogic weblogic-monitoring ~ read. WLSDM Version is really mature and assertive anymore..
No server, No Database... No additional resources. Don't waste your money and time. 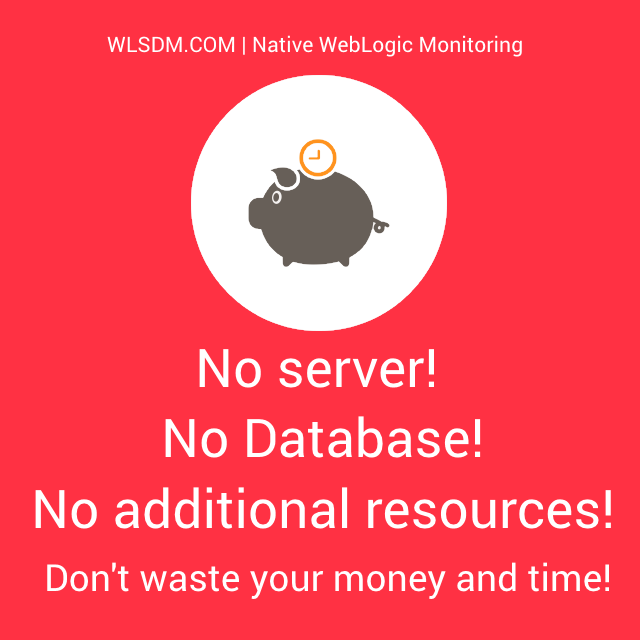 WLSDM does not need any additional resources (Server, Database, Memory, CPU... etc.). This means you don't need to spend operational costs for your WebLogic monitoring tool. Only keep your WebLogic Admin Server UP and HEALTHY. Centralize WLST scripts by using WLST Web Console. Automate WebLogic domains by using User Defined MBean Actions. Free Developer Edition (Fully Featured) - WLSDM can be used by developers for free! Data source passwords are listed on domain summary page (Decrypted and Encrypted) - All users are forbidden except administrators. Anymore all users and user groups able to login WLSDM console. Page authorization is enriched. WLSDM Review by Radu Dobrinescu WLSDM for WebLogic v2.1.5 Released.. It's on WebLogic Community Portal! Copyright © 2019 WLSDM Version 2 Released! Things are really different anymore.... All Rights Reserved. | WLSDM.COM, Inc.